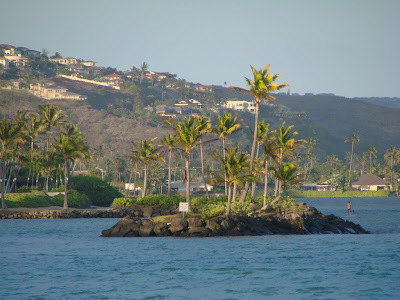 Here is a picture of one of the man-made islands which is part of “The Kahala Hotel and Resort” The area just to the left of the island is where many weddings are held and some are even held on the island itself. This was the view from Kahala Beach. Just to the right of the island you see a paddle boarder which is just one of the many activities this resort offers. 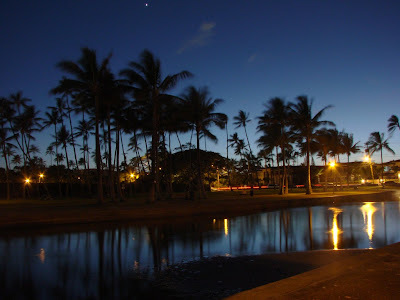 Here is another picture of Waialae stream this time taken at night. I left the aperture open to collect the light. It always amazes me how it can turn darkness into a picture if enough light is present though shots like this can really take a toll on the camera batteries. If you do any long exposure shots be sure to bring extra batteries. 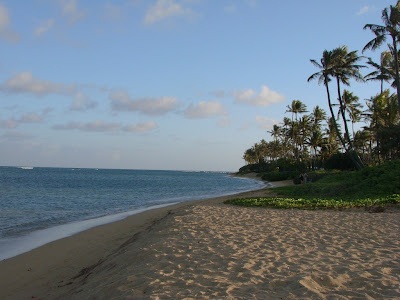 Here is a picture of the Kahala Beach shoreline taken just before sunset at Bob’s Moonwalk. The part of the beach goes behind many of the houses on Kahala Avenue. We made it to the furthest point in the photo then we hit an area where the water was all the way up to some walls. In Hawaii the beaches are considered public property and homeowners and businesses are required to allow access to the beach.